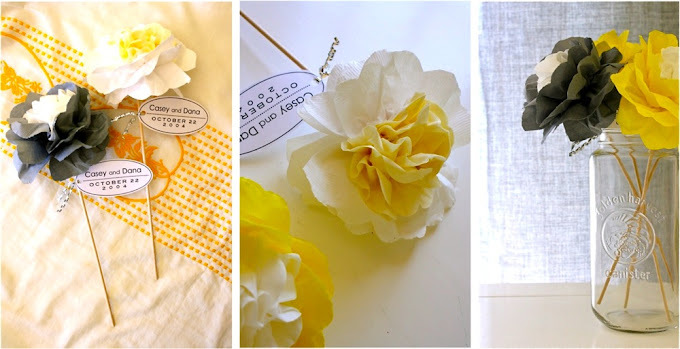 Well, the other days I decided to take the Wallflowers tutorials, slim it down, add a small wooden dowel, and voila: pretty napkin flowers for the table and other types of decor. 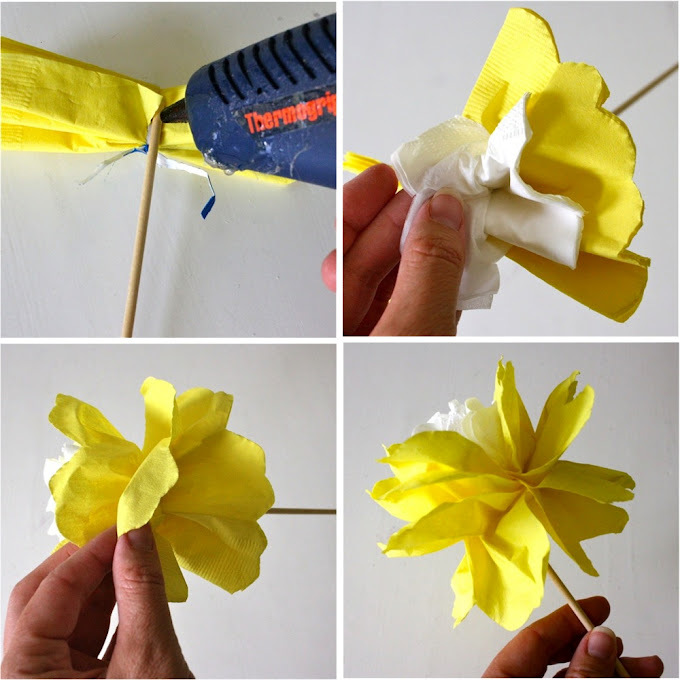 Now these are the kind of paper flowers I can wrap my head around! After making 100s, you’ve still got your sanity (and pennies!…for other important matters, like a tropical honeymoon). The concept is nothing new. 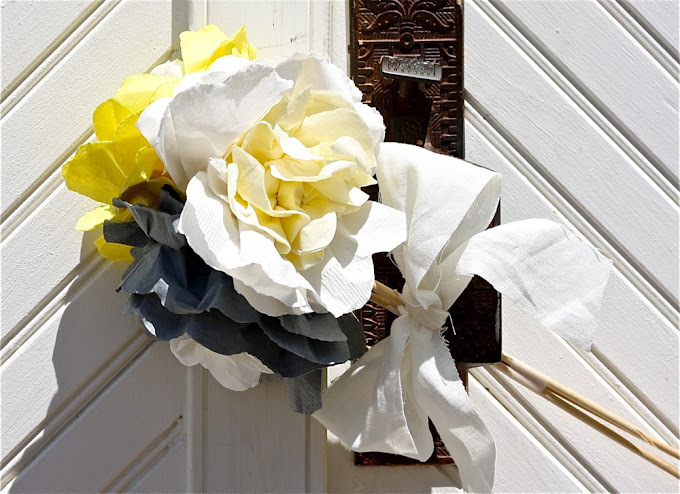 These are the same tissue paper flowers you made in 2nd grade BUT….when made from party napkins, the flowers take on a life-like form with classy flair. 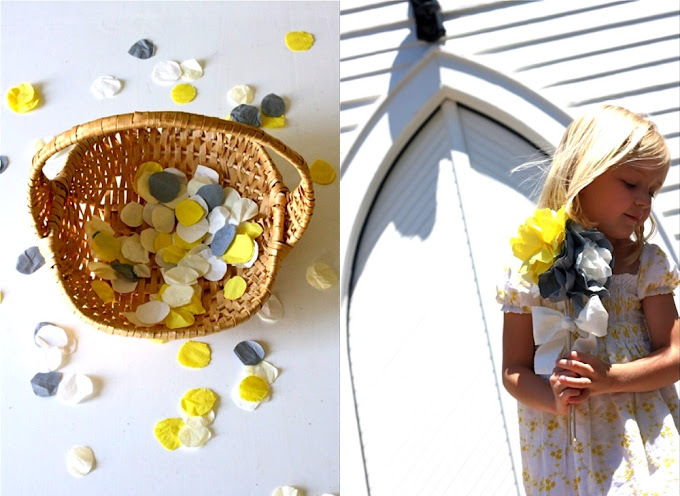 The stiff petals are bendable and easily shaped into gorgeous flowers. Too bad I wasn’t a crafter 8 years ago. My mother would have loved it if our floral budget called for 10 packages of napkins and wooden dowels. 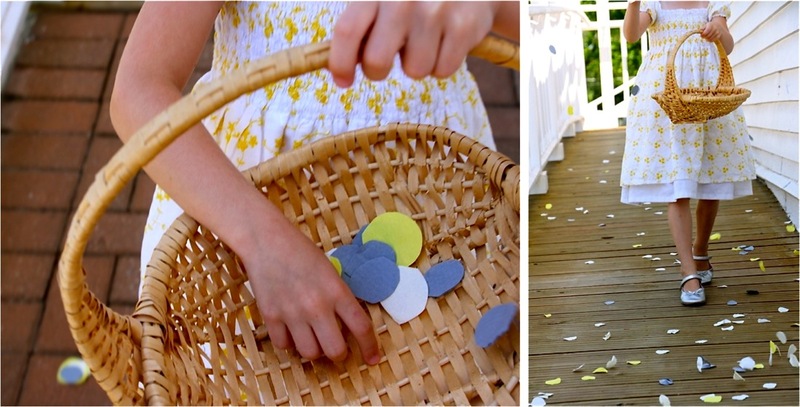 Cut the napkins into small petals to sprinkle along the wedding walk. 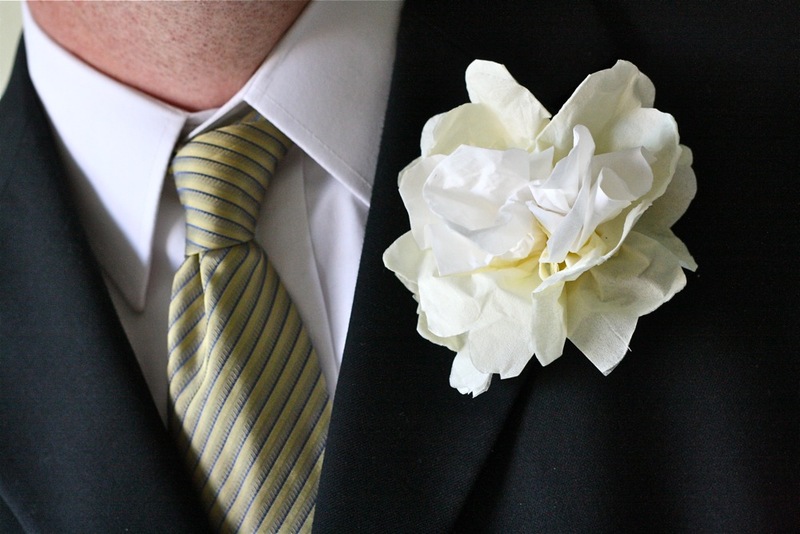 and make sure your man is decked out in napkin as well. Ready to make simple gorgeous flowers by the dozen? Dowels – any size your prefer. They’re about $2 at Hobby Lobby. If you want to spray paint your wooden stems, check out the No-Sew Flowers Tutorial for details. Party Napkins – I prefer using two sizes: medium and small. If you can’t find small ones, simply trim the middle napkin down to a smaller size. All these colors were purchased at Hobby Lobby, $2-$3. Ikea also has nice paper napkins. Okay, we’re only using two napkins here: one for the outside, one for the middle. * Trim slightly around the folded edges so that each napkin layer is separate. 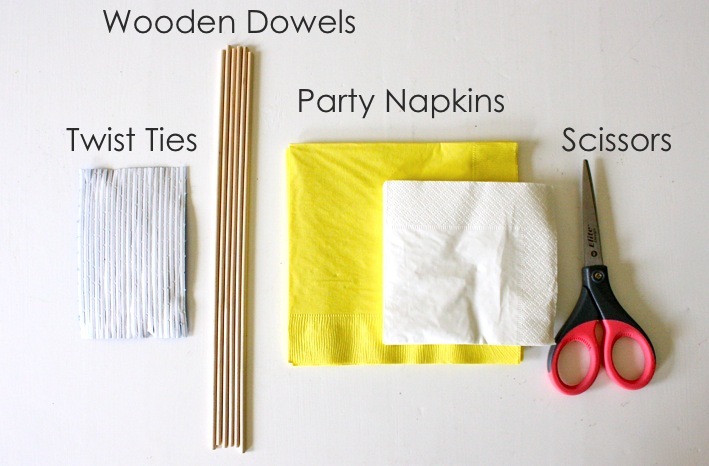 * Fold both napkins up together like an accordion or fan. 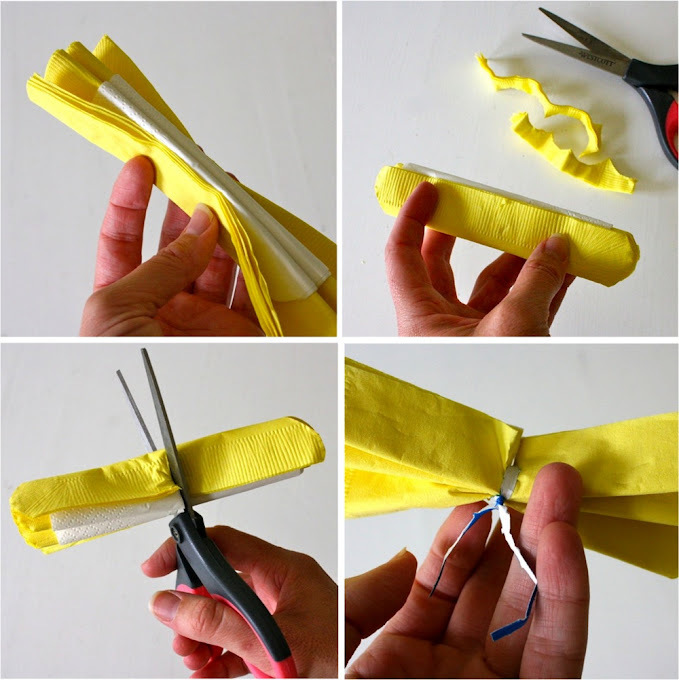 * Cut a semi-circle on both ends of the fan (this makes the outer napkin scalloped as well). * Make a small cut in the middle of the flower but do not cut all the way through! * Place a twist tie in the middle and twist it tightly closed. 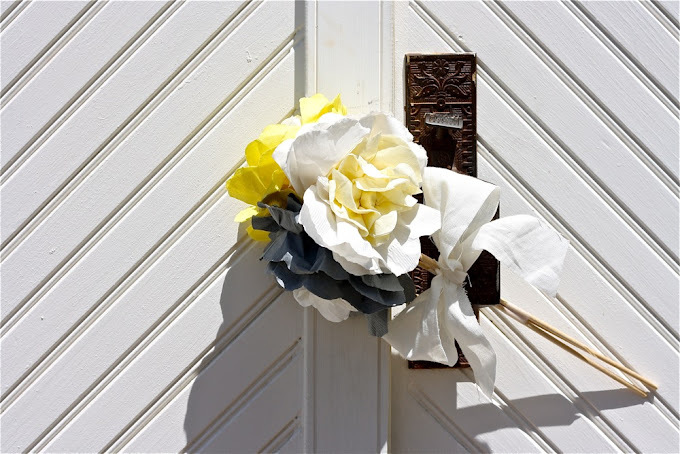 * Place a dowel next to one side of the flower and hot-glue it in place (or you can simply twist the tie around it as well. It’s not as secure for long-term use but works pretty well). * Carefully pull the flower petals back and shape them as you’d like. You’re done! Simple yet elegant. If I were doing my wedding again, Napkins would be all over our house. 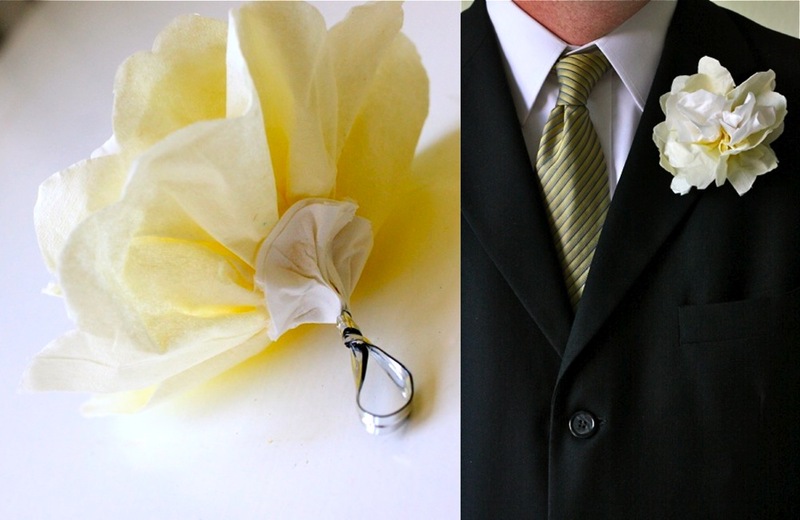 Print your names and date, punch a hole, and use a decorative tie or string and attach it to each flower. Use the end of a dowel to curl the twist tie strings. 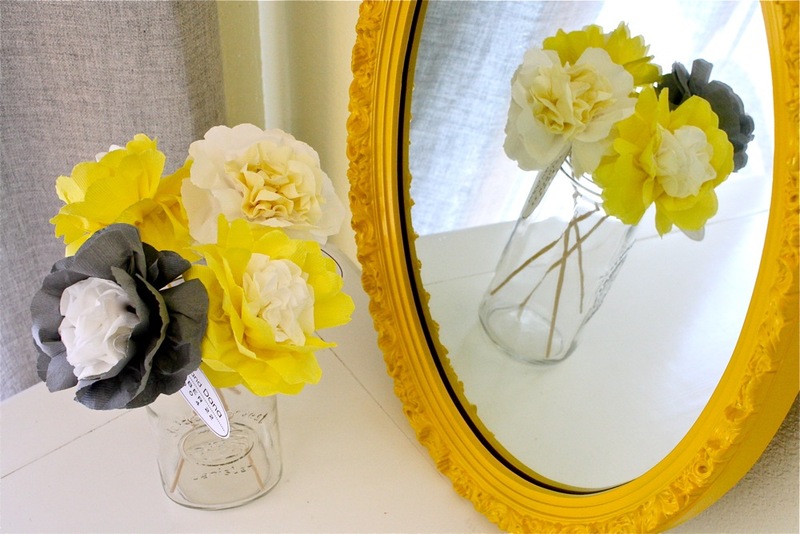 Who doesn’t like to go home with a pretty flower?–especially one that lives forever. For the men in the wedding party, it’s also easy to make napkin boutineers. * Bend the end of the twist tie into a loop so it looks decoratively tucked away. 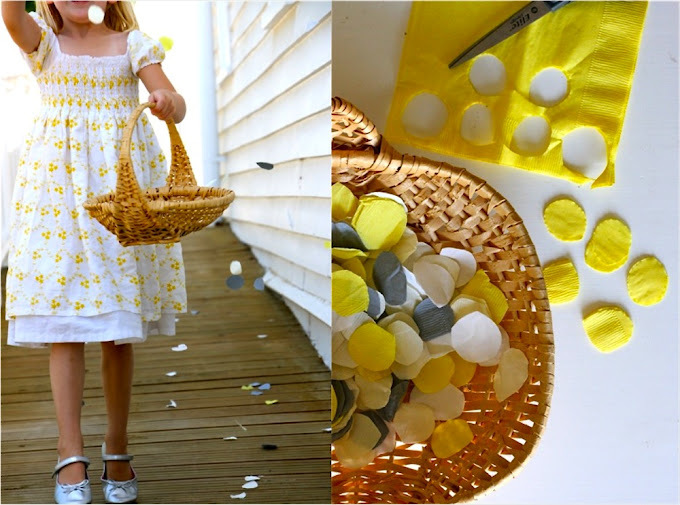 * Cut a circle of tissue in a pacman shape–Felt also works great! 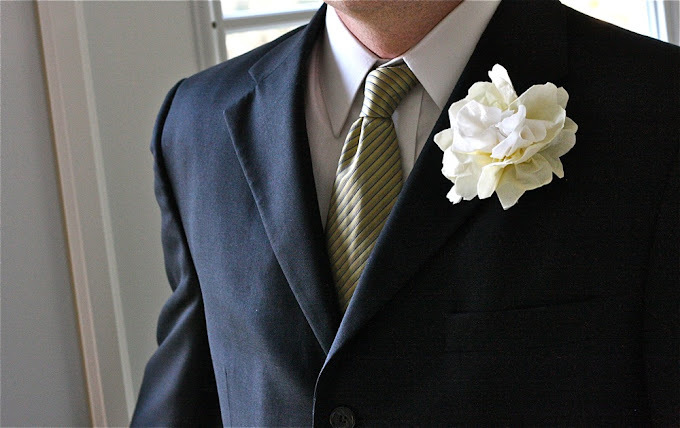 Glue it to the bottom of the boutineer for a polished look. And pin it on your man with a straight pin. Just as handsome as he was on October 22, 2004. Don’t forget to cut small napkin petals for the flower girl. She’ll love the paper sprinkles. Your wedding is set!–and you’ve got piece of mind. No worrying about fresh flower coordinating, wondering when they’ll arrive, if they’re going to make it through an ice storm, if they’ll last the entire day. Your party is ready. Handmade doesn’t need to look cheap, though it can be cheap! ummmm….i can see any photos?? I just fixed the photos! 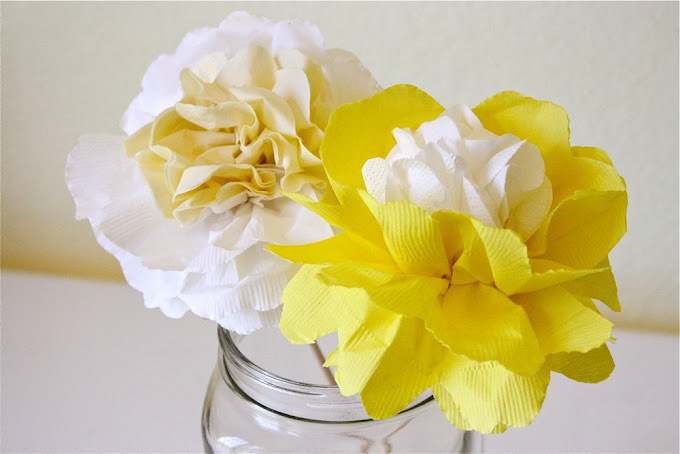 I’m headed to Hobby Lobby tomorrow to buy the supplies for these gorgeous napkin flowers! 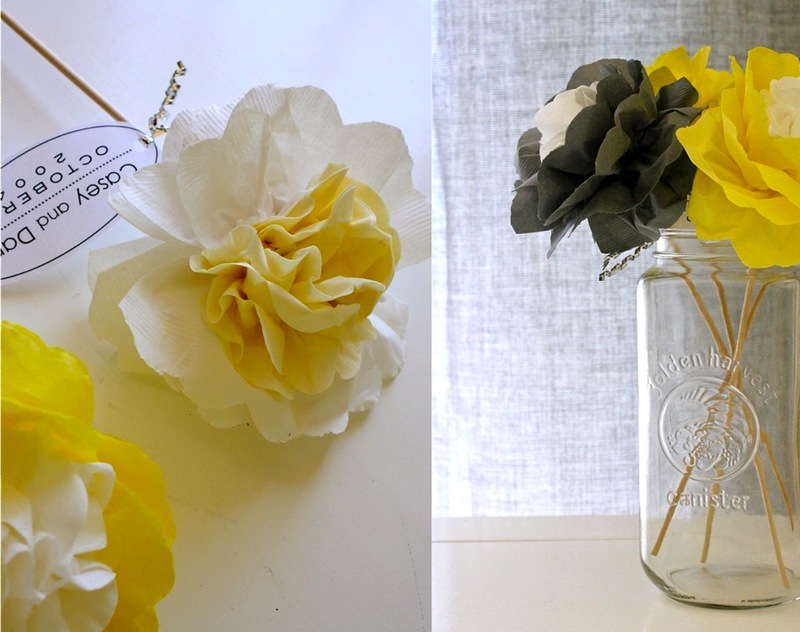 I am not a crafter, but I think I can do these. Thank you so much for sharing. I’m glad that you simply shared this helpful information with us. Please keep us up to date like this. Thank you for sharing. or sell, this futures long term contract at a chosen value. quickly together with these types of possibilities. Digital camera, Range, One Touch, Effect Up/ Lower along with 58 A few moments. merely involving the speculator as well as the agent, consequently why they’re named kind legal agreements. In case you have a new effectively considered game plan, you do not just become rewarding, nevertheless you will be able to create oneself up to your retirement living too.